Proteofection – known as the direct transport of proteins into living eukaryotic cells – is a versatile alternative to transfection of nucleic acids and opens up a range of new options in research of eukaryotic cell processes. With cationic lipids especially aligned to proteins, and specifically their surface structures, it is also possible to introduce proteins in eukaryotic cells. Such lipid-based formulas spontaneously bind with proteins to form protein-lipid complexes known as proteoplexes. These proteoplexes are actively taken up by eukaryotic cells by means of endocytosis and transported into the cell interior. 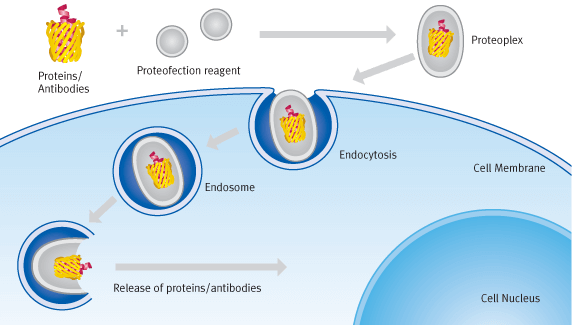 Both the proteins and the antibodies, with structure and function unchanged, are released from the endosomes to develop their activity there. Proteins differ from one another in term of size, structure, composition and bio–physical properties. Unlike different nucleic acids which have very similar bio–physical properties, the association of proteins with PROTEOfectene® is highly variable. Thus, optimal delivery conditions for one particular protein cannot be transferred to another type of protein. Due to their specific properties some proteins might not be efficiently delivered with PROTEOfectene®. For instance, highly alkaline proteins that have an elevated isoelectric point are very difficult to deliver into cells. Because antibodies differ among themselves less in their bio-physical properties, the probability for an antibody to be successfully delivered in a cell by PROTEOfectene® AB is relatively high. There are no general rules to determine whether a specific protein or antibody can be delivered or not. We thus encourage you to trial evaluation of PROTEOfectene® or PROTEOfectene® AB with your protein/antobody of interest (Free Sample Offer).